"I don't know if I'm on course… My ship isn't telling me." Where did this come from?! Vertical Ent. 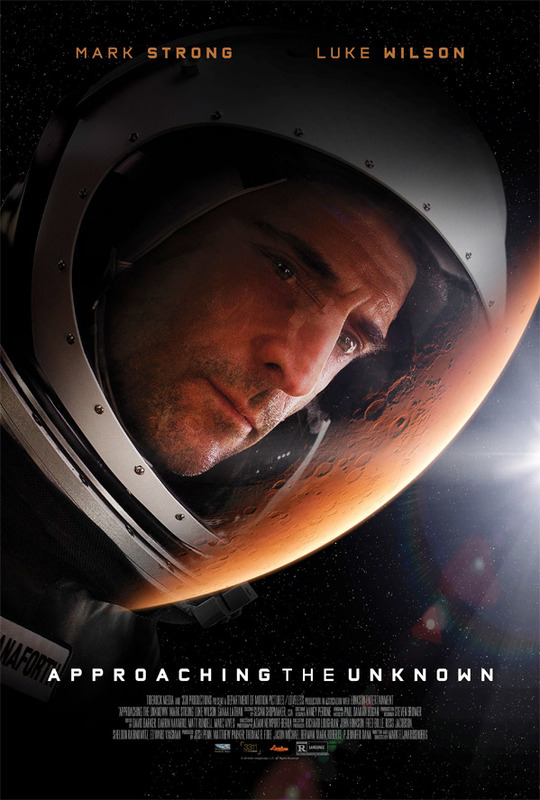 has released a trailer for a film called Approaching the Unknown, a sci-fi drama about an astronaut on a one-way solo mission to colonize Mars. Mark Strong stars as Captain William D. Stanaforth, and it's great to see Strong in a lead role. The cast includes Sanaa Lathan, Charles Baker, Anders Danielsen Lie and Harry L. Seddon, but this is really a one-man show. There are some crazy cool visuals in this trailer, his spacecraft drifting through weird anomalies in space, but it looks damn good. The line at the end - chills. Captain William Stanaforth is on a one-way solo mission to take the first steps in colonizing Mars. Like all pioneers throughout history, Stanaforth will face insurmountable odds and life and death decisions as he rockets bravely through space. Approaching the Unknown is both written & directed by newcomer Mark Elijah Rosenberg, making his feature directing debut (his only other credit is "Special Thanks" on Beasts of the Southern Wild). This hasn't played at any film festivals or otherwise yet. Vertical Entertainment & Paramount Pictures will release Approaching the Unknown in select theaters starting June 3rd this year. Well it can't go more wrong than his trip to the sun haha. It is good to see Strong in a leading role but everyone who knows him knows he should have no problem in a leading role. He can do badass, funny, scary and charming. Right? I was thinking the same thing about Sunshine. Looks like a combination of The Martian and Moon which could be cool but can't help but think this is just a cash grab after The Martian's success. I like the concept. My only gripe is that it looks like nobody taught him how to use an erg machine. Seems like it's a concept film; what happens to the astronaut who cuts the cord to earth and journeys off into space on his own? To me that relies too much on the ending to work. If the ending stinks, the whole movie falls apart. And at least up until the turning point it doesn't look very original. Possibly a good performance by Strong, though. Could be cool. Love me some Mark Strong. Though I'm past one hundred thousand miles I'm feeling very still And I think my spaceship knows which way to go Tell my wife I love her very much she knows Ground Control to Major Tom Your circuit's dead, there's something wrong Can you hear me, Major Tom? Can you hear me, Major Tom? Can you hear me, Major Tom? Can you "Here am I floating 'round my tin can Far above the moon Planet Earth is blue And there's nothing I can do"
Aside from Strong's goofy accent, this looks like it has some serious potential at being a great film.